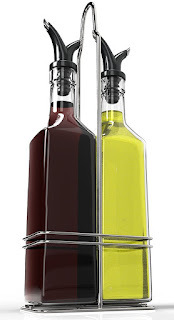 Today ONLY - Olive Oil and Vinegar Bottle Glass Set with Stainless Steel Rack $9.99 (Retail $39.99). -[PATENT PENDING] CLASSIC - Keep the dinner table elegant with the classic square-shaped Oil and Vinegar Dispenser Bottles. Also equipped with a Dual Spout design so you can pour a little for individual dishes, or a lot for cooking in the kitchen. -CONVENIENT - Unlike our competitors, each of the Royal Oil and Vinegar Dispenser Bottles can hold up to 17oz, so you won't have to worry about refilling often. Built to automatically ventilate as well, for easy pouring over salads, pastas, sandwiches, and more. -PREMIUM - Made of premium durable BPA free rubber stoppers and equipped with a strong, unique glass, this Oil and Vinegar Set is built to last. No drips, spills or accidents with these bottles. -VALUE - Get the most for the least and avoid cheap, generic dispensers on the market that will drip down the bottle and break. This set includes 2 Oil and Vinegar Glass Bottles and 1 polished steel rack for a sleek organized look and storage. Keep your kitchen lively with this salad dressing set. -GUARANTEE - Easily the best value Oil and Vinegar Dispenser Set one can buy, we have also gone the extra mile and made a statement to stand behind our Royal Oil and Vinegar Set. So you are covered under a 30-Day 100% Satisfaction or Money Back Guarantee. Try this 3 piece set with zero risk today.